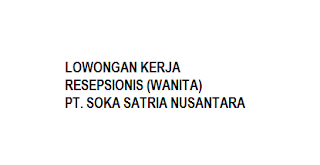 JANGAN LUPA PADA SURAT LAMARAN SEBUTKAN POSISI YANG DIINGINKAN. KARENA KAMI MENERIMA BANYAK BERBAGAI JENIS PEKERJAAN. TERIMA KASIH. 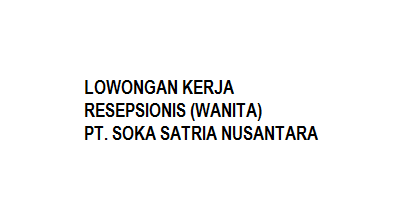 0 Response to "LOWONGAN KERJA RESEPSIONIS (WANITA) PT. SOKA SATRIA NUSANTARA"